Experience an ocean oasis of indescribable beauty and biodiversity on this extraordinary expedition through Indonesia. Journey into the heart of the Coral Triangle and explore the incredible underwater riches of Raja Ampat, Komodo National Park, the Banda Islands and Ambon on a divers and snorkelers dream adventure. On land get close to the largest lizard on earth, the Komodo dragon. Rise early to see the spectacular Bird-of-paradise and see thousands of flying foxes fly overhead at sunset. Walk through rice paddies, visit bustling colorful markets, temples, traditional villages and meet the friendly locals. Be pampered, dine on delicious cuisine at a private Balinese villa and onboard our privately chartered luxurious yacht. Start your expedition in Komodo National Park in your beachfront bungalow at a private island resort. Surrounded by stunning island landscapes go in search for Komodo dragons in their natural habitat. Be astounded by the diversity of marine life as you dip into the warm tropical waters. Discover an abundance of colorful reef fish on the shallow reefs, mantas circling over cleaning stations, patrolling sharks and pelagic fish schooling off the current-swept seamounts, walls and pinnacles. Head to Ubud in the highlands of Bali for a three-night stay in a stunning Balinese hotel, reserved exclusively for our Wild Earth Explorers. Walk through lush rice paddies, visit picturesque temples, stroll through the colorful local markets, learn how to cook a traditional meal and experience the Balinese way of life. Board one of Indonesia’s premier luxury yachts the Dewi Nusantara to dive, snorkel and explore what has been hailed the #1 marine biodiversity hotspot in the world, the Coral Triangle. 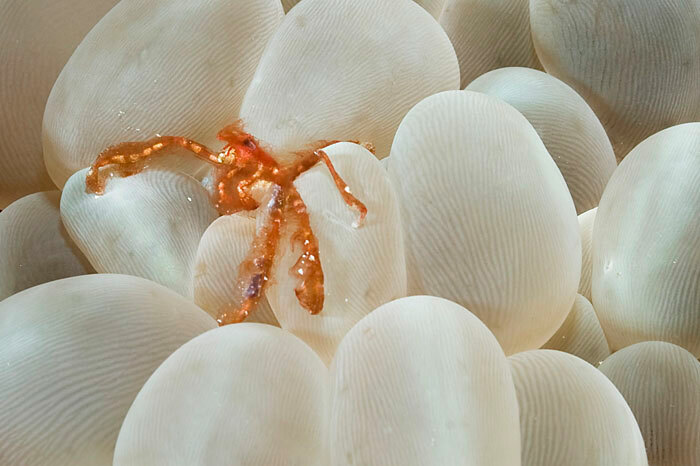 Start your expedition onboard the Dewi Nusantara in Ambon, one of the muck diving hot spots on the planet in search of some incredibly weird and wonderful critters. Stop at the island of Koon for passing pelagics on your way into the Banda Sea. 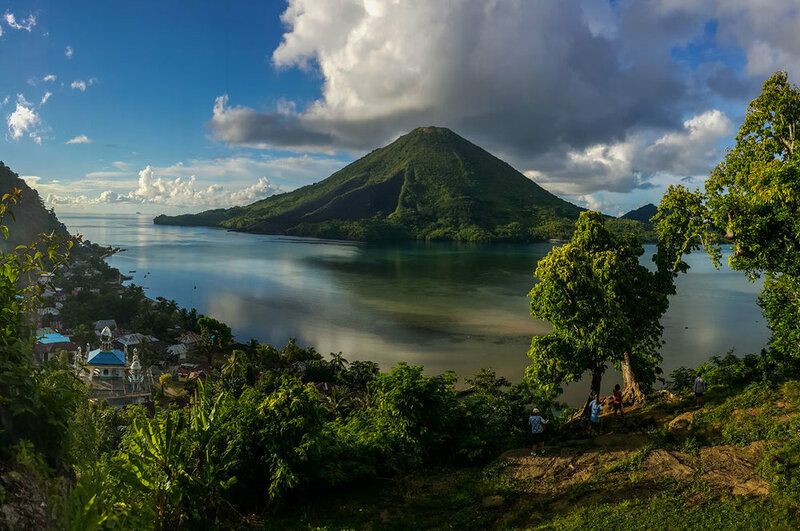 Soak up the history of the Banda Islands, famous for their spice trade, discover its incredible reef drop offs brimming with schools of fish. Head up to southern Raja Ampat for the colorful soft coral reefs surrounding Misool. Here the pulse of marine life thrives from the sea floor to the surface where the kaleidoscope of corals can start in less than a meter of water. 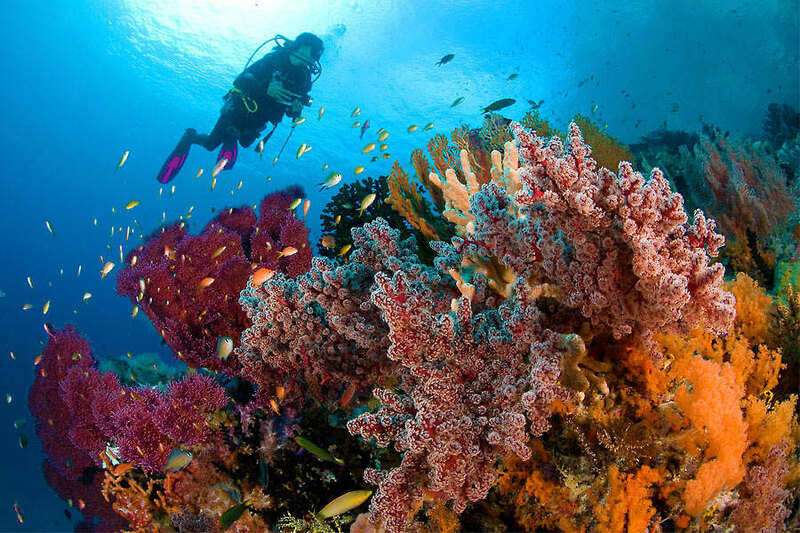 The experience of drifting along miles of exquisitely hued reef, brimming with activity, is simply breathtaking. Continue your travels to northern Raja Ampat with its plethora of reef fish (27 endemic), numerous crazy critters all co-inhabiting its spectacular reefs, seamounts and cleaning stations. The jewel-like islands are caressed by a convergence of swift nutrient-rich currents boosting an enormous variety of life. Visit Penemu lagoon and climb the hill for fantastic panoramic views. Finish your expedition in Sorong in West Papua for your flights home. 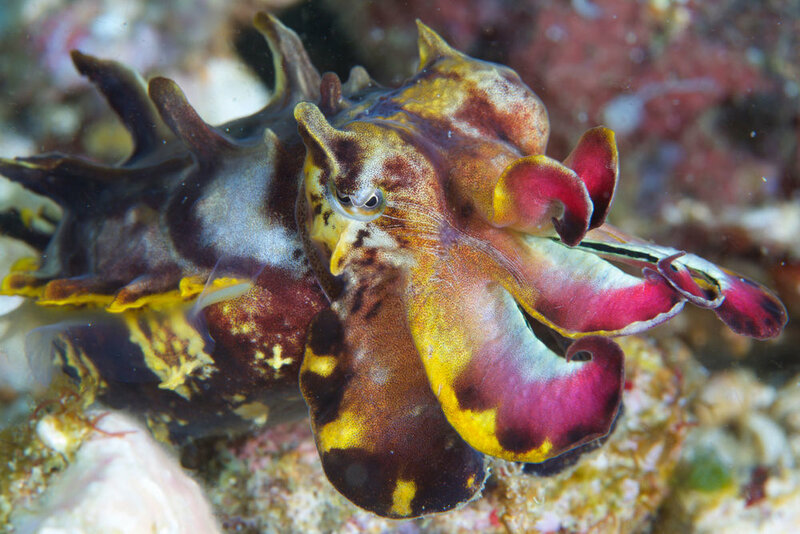 Search for weird and wonderful critters in the Muck in Ambon. Complete your expedition with a couple of extra nights at the beautiful Papua Paradise Eco Resort. Situated along the pristine shoreline of the uninhabited island of Birie, in the very heart of northern Raja Ampat. 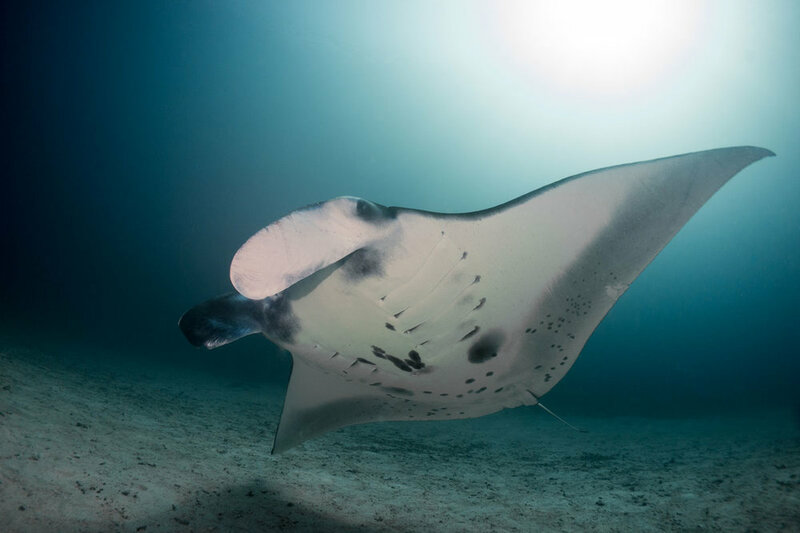 Surrounded by pristine reefs and unspoiled flora, this is an amazing haven for both divers and non-divers alike. The island is teeming with exotic bird life, lush jungle foliage, while the reefs in the surrounding area offer world-class diving. The elegant overwater bungalows are the perfect place to relax and simply enjoy the beauty of Indonesia before returning home. Inform our friendly Wild Earth Team of your interest in Booking a space or place and Enquiry about the trip details. We have added you to our email list so look out for our newsletters in your inbox with information about this trip and other expeditions that we run. We can shape this Island add-on to your desire. Contact us for pricing and more details. 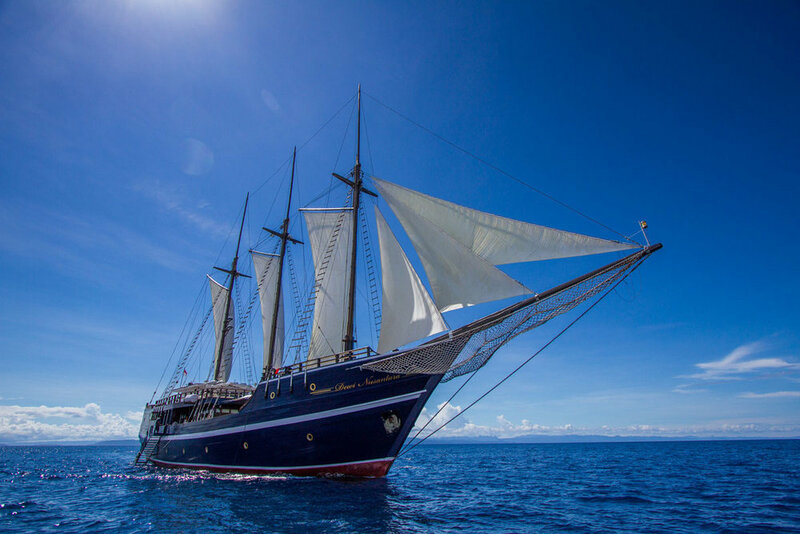 The Dewi Nusantara was built in 2008 in Kalimantan, Borneo. This hand build traditional 3 mast US top sail Schooner took over a year to construct before she took her maiden voyage on the Lembeh Strait. With an overall length of 58 meters (191 feet) and a beam of over 12 meters (37 feet) the vessel has 8 deluxe staterooms with a choice of twin cabins, doubles and one spacious master suite (sold on a first come first serve basis). All cabins are furnished with either twin or king sized beds, en-suite bathrooms and a/c There is a very spacious dedicated camera and equipment room with multiple charging stations, camera benches and a computer workstation. The Dewi Nusantara was purposely designed to cater to those who seek quality, safety, caring service and the most elegant schooner available. PHOTO CREDIT © Thomas & Natalia Baechtold, Hotel Villa Ubud, Komodo Resort, MY Dewi Nusantara, Andrina Bindon, Maluku Divers Resort, Papua Paradise Eco Resort, Adobe Stock.